Microsoft is resisting a DOJ data request for information stored in a data center in Ireland. 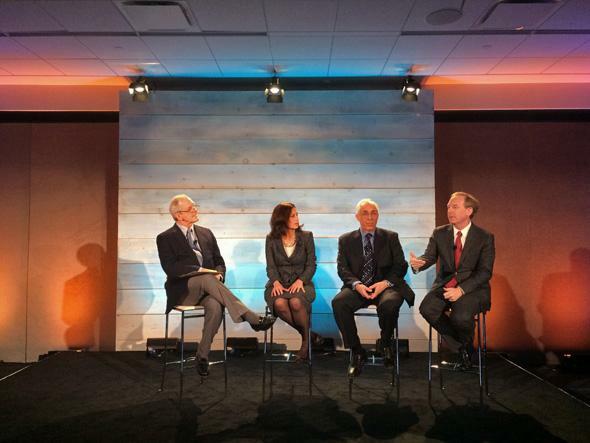 From left, former Good Morning America host Charles Gibson, Software Alliance President and CEO Victoria Espinel, partner at Mayer Brown Andrew Pincus, and executive vice president and general counsel for Microsoft Brad Smith. This year, Microsoft has been working to oppose a search warrant from the Department of Justice that seeks emails and other personal data for a suspect. Microsoft claims that since the information is stored in one of its Irish data centers, it doesn’t have to comply with a domestic search warrant. Microsoft has been raising awareness and rallying tech companies, trade groups, and computer scientists to weigh in on the case, because it has implications both for the security of Americans’ data overseas and the ability of other governments to demand data stored in U.S. data centers. On Monday, Microsoft announced that 10 groups are filing amicus briefs on its behalf signed by a total of 28 technology and media companies, 35 computer scientists, and 23 trade associations. Supporters include Apple, Verizon, the Guardian, the U.S. Chamber of Commerce, and the Electronic Frontier Foundation. Microsoft, which has had setbacks in both the initial ruling and subsequent appeals, seems to be hoping that broader support will help it show the court the implications of the ruling, should law enforcement officials be allowed to issue search warrants for overseas data centers. Andrew Pincus, a partner at Mayer Brown, pointed out that the value of the cloud comes from its ability to reduce costs for industry and individuals by creating an economy of scale for data storage. He said actions like overseas searches errode companies’ confidence that they can store their confidential documents and trade secrets with companies like Microsoft. “Basically no one will use the cloud if companies think that they are going to lose control of their data,” he said. Of course the entire tech sector understands that this is about this country’s ability to create technology that leads the world and has access to the foreign market. It is about economics. … But ultimately it’s about trust. … This case is about whether people will have the right to have their email protected by their own laws and their own governments and their own constitutions. Microsoft and its allies emphasize that there is already a system in place for countries to work together on information gathering for law enforcement. Known as mutual legal assistance treaties, or MLATs, these agreements are the way Microsoft thinks the Department of Justice should seek the information that is stored in the Irish data center. If Microsoft received a data request through an MLAT rather than a domestic U.S. warrant, it would presumably cooperate. Smith said that tech companies have become like banks. And if Mary Poppins or the 2008 financial crisis have taught us anything, it’s that people want to feel like they still control their money, even when it’s held by another entity. “You’re not gonna put your data in a data center or the cloud if you don’t have confidence about who can and can’t get access to it,” Smith said.